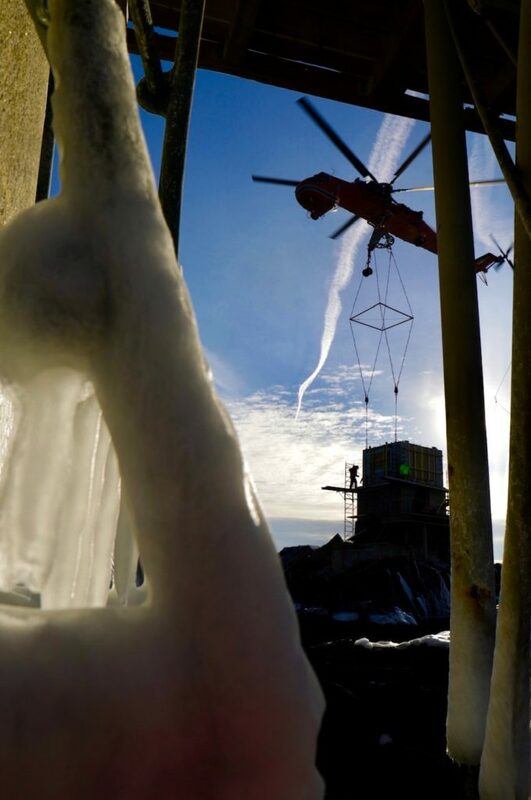 Erickson Air Crane lowers the first wall panel of the second story of the Oil House. 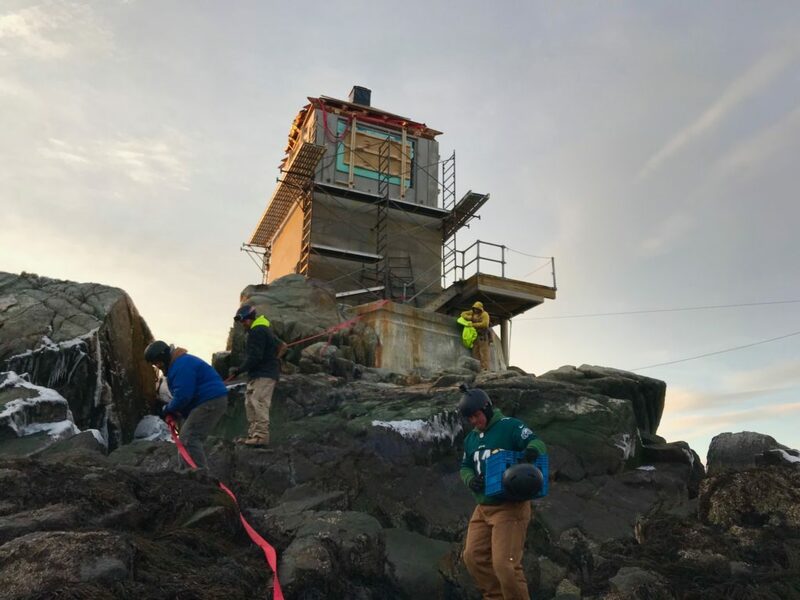 In 25-knot winds and sub-freezing temperatures, a daring and dedicated crew of 30 put a second story and new roof on the Graves Light Oil House. We have been working since last spring to convert the Oil House into a guest cottage. 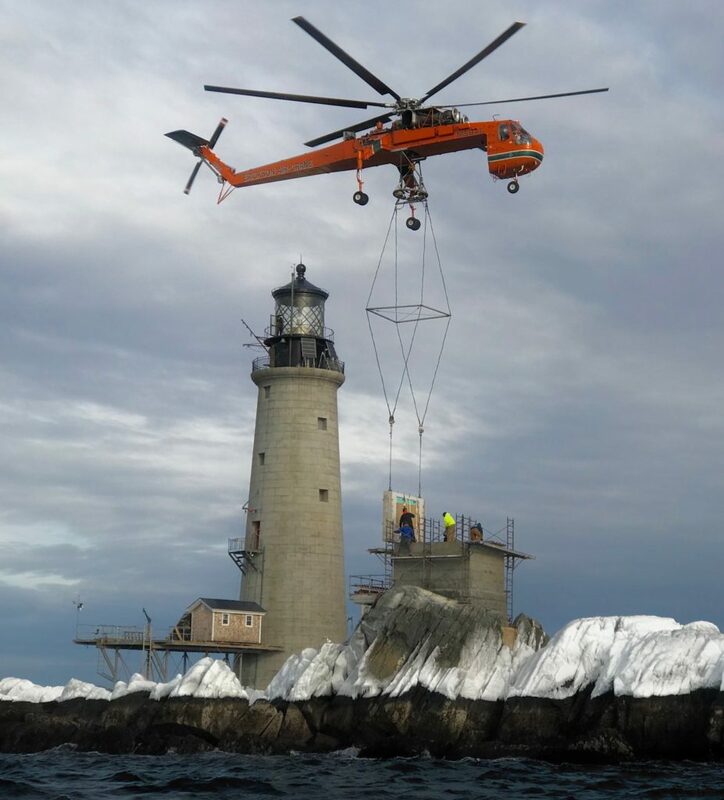 A heavy-lift Erickson Air Crane helicopter ferried the five-ton marine concrete walls and a completed timberframe roof from a barge to Graves Ledge. 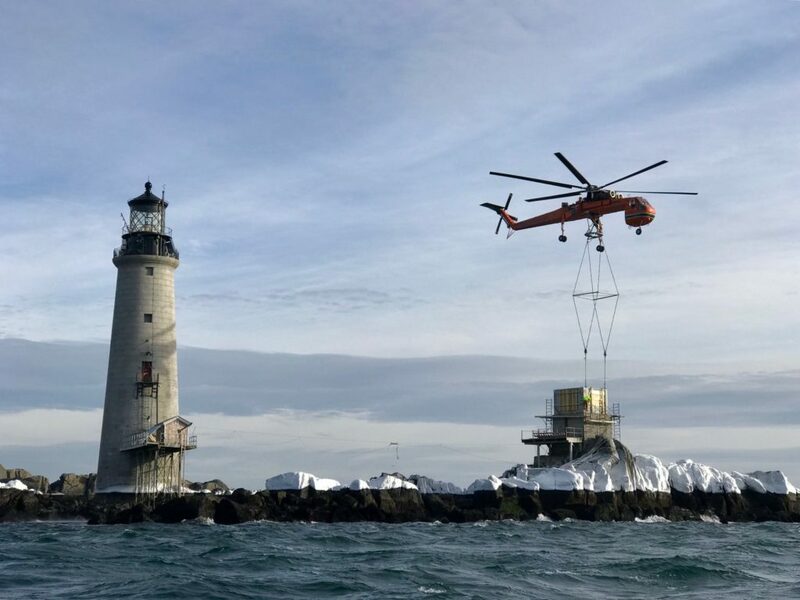 Waiting crews guided the massive pieces in place as the helicopter – Erickson’s civilian version of Sikorsky’s military CH-64 Tarhe Skycrane – neatly lowered them, one at a time, on the heavy granite Oil House. The Oil House was built in 1905 to store whale oil used to fuel the Graves Light beacon. It is made of heavy granite blocks and has withstood all seas and weather ever since. Making an equally tough second story was a task we gave to Carson Concrete, which pre-cast the four interlocking side panels in Pennsylvania and sent them to Boston by barge. The original wooden roof also survived, but was too battered to salvage. 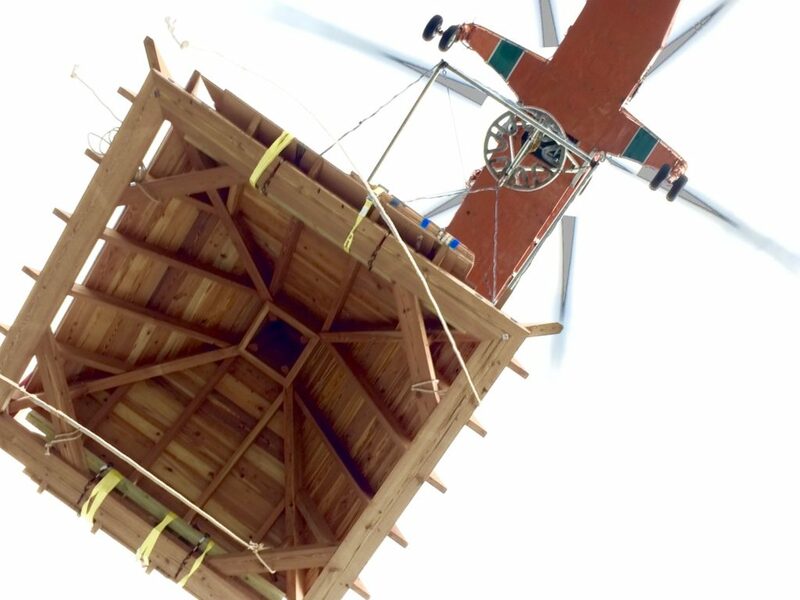 Haystack Joinery in Maine built a magnificent timberframe replacement on shore. 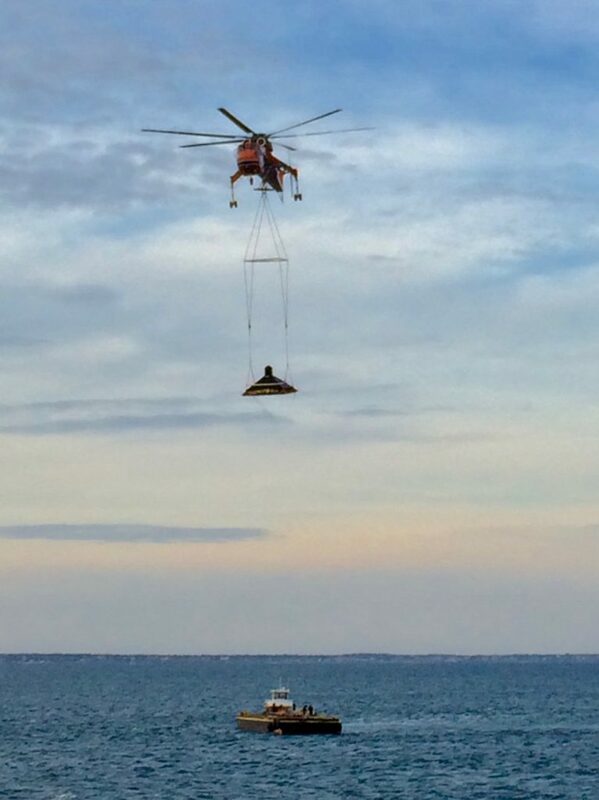 We helicoptered it out in one piece along with the concrete second story. Hats off to our most daring and dedicated crew, which pulled off the job flawlessly on the icy ledge. Everyone’s safe. Another wall is set atop the original granite first level. The handcrafted timber frame roof makes its way to the Graves Light Oil House. The timberframe roof is lowered into place.